Smart Cookies Put Targeted Online Ads On The Rise Google is one of the many companies vying for a chunk of the online display ad market, a domain that is becoming more lucrative as it gets a whole lot better at targeting the right audience. Google has erected a new interactive billboard in New York's Times Square as part of "Watch This Space," the company's campaign to promote its lesser-known display advertisement services. For the past decade, Google has dominated online advertising space with search ads that match advertisers with people who search for their products. But last month, Google put up an old-fashioned billboard right in the middle of Times Square in New York to remind everyone that it's also in the display ad business, making it one of the many companies that are vying for a chunk of that market. That's because display ads, the ads that run on the sides and tops of websites, are becoming more lucrative as they get better at targeting the right customers. Let's say Internet user Jane Smith is in the market for a car. She's browsing around on, say, General Motors' website and while she's there, the site places a cookie -- or tracking device -- on her browser. Michael Baker, the president and CEO of the online advertising technology company DataXu, says that cookie tells advertisers just what they want to know. "They've measured the fact that you came to their website but you did not buy," Baker says. That means they now know Jane is looking to buy a car. "As she continues surfing, she next goes to CNN," Baker continues. And that's when she sees something interesting: an ad for a new car. 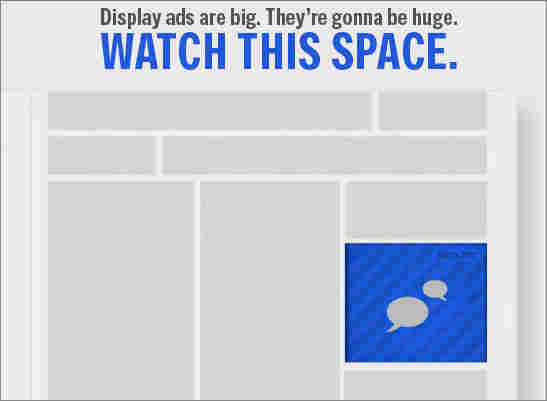 This is the new world of targeted online display ads -- and it goes pretty deep. "There are sort of a host of other kinds of data points that are available for targeting," says Joanna O'Connell, who follows online display advertising for the marketing research firm Forrester Research. "Your gender, your age, your income, whether you have children. Psychographic information like whether or not you consider yourself to be an introvert or an extrovert or liberal or conservative." Companies like Yahoo are well positioned to be gathering up this kind of information. According to Yahoo's vice president of North American sales, Mitch Spolan, more than 600 million people visit Yahoo every month and about half of them have Yahoo accounts -- meaning they've offered up their name, gender, birth date and ZIP code. "There is certain information that they volunteer when they're registered that we can leverage to deliver even a more targeted message," Spolan says. So targeted, in fact, that Yahoo can run a kind of ad exchange, or computerized auction for ad placement. So when Jane Smith goes to a particular website, all sorts of information about her is sent to the exchange. In a millisecond, advertisers may know that Jane is looking for a car, is a mother of three, lives in Phoenix and has a household income of $150,000. Advertisers looking for someone like Jane will then start bidding to get her to see their ad. "We have thousands of advertisers that are bidding in real time on these impressions to reach the target audience that they're seeking," Spolan says. Jane's eyes will eventually go to the highest bidder -- so that Jane may ultimately see an ad for an SUV that's family safe and for sale near her Phoenix home. Joanna O'Connell says that's just the kind of targeted advertising that is helping to revive the online display ad market -- which is expected to grow by 6 percentage points in the next four years, according to the analyst firm eMarketer. "It's less waste," O'Connell says. "It's a better impression for [the advertiser] and they're going to be willing to pay more." But that isn't all good news. Some, like Jeff Chester of the Center for Digital Democracy, think the new world of targeted display ads has gone too far. He says as people continue to handle more of their personal business online, from health matters to personal finance, advertisers could begin gathering information that many would not want to share. "You're talking about a commercial system that's a digital dossier about your innermost secrets, concerns and personal matters," Chester says. "These Fortune 1000 companies, these big advertising companies, not only do they know that but they're studying those behaviors very closely." Proposed legislation might give consumers more control over their own information, but Steve Sullivan, of the industry trade group Interactive Advertising Bureau, says that's not really the issue. "Most people are not actually concerned about receiving a targeted ad," Sullivan says. "Most people are concerned about somebody they don't know taking information about them and using it for some bad purpose." And to that, O'Connell says that for fear of offending potential customers, the industry will regulate itself. She says advertisers know many people find it creepy when an ad follows them around. "There's sort of the human element -- the sort of 'ick' factor -- and marketers are aware of that," O'Connell says. "Depending on the marketer, there are some that are very reticent about using certain types of marketing." She says that many consumers recognize the role ads play in supporting free online content. But while that may mean consumers are happy to watch an ad, it does not necessarily mean they're willing to give up their privacy.